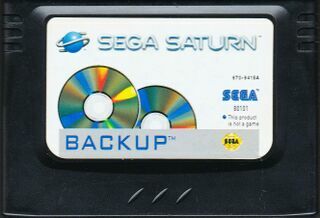 The Sega Saturn Backup Memory, otherwise called Back-Up RAM Cartridge in the US or Power Memory (パワーメモリー) in Japan, is an external storage cartridge used to save game progress and data as an alternative to using the system's internal memory. The cartridge provides over 16 times the amount of space; offering up to 512k of memory as opposed to the internal 32k. The cartridge works similarly to the CD BackUp RAM Cart offered for the Sega Mega-CD. Some games were distributed with stickers for the Backup Memory, including Policenauts and the North American release of Dragon Force. There are also numerous Saturn third-party memory cartridges. When reading save data from the memory manager on the Sega Saturn BIOS, it will appear in this format. Name of the file Extra comments on the file. The amount of space (Blocks) that file occupies. How each file is named and what the comments field represents depends on how the developer has written each descriptor. When reading other articles on Sonic Retro and Sega Retro, keep in mind these common symbols represented in the wiki to determine the text as these variables are likely to differ when viewing on the Memory Manager. Main article: Saturn Backup Memory/Magazine articles.